When it comes to Robotics teams, a 3D printer can prove to be a very useful item! So with the help of a Grant through the Greenbush Community, our team-5172, was able to purchase one! We are so grateful for this opportunity. Callahan Stewart, who is our student Website Manager, took on the job of learning how to use the printer. He is now helping to teach other team members how to use it. Here is a brief description of how the printer works. Imagine a hot glue gun. The tip of the gun heats up to allow the glue to move out. 3D printers work similarly by heating lines of plastic that comes in large spools (like thread) and laying it down in thin layers. 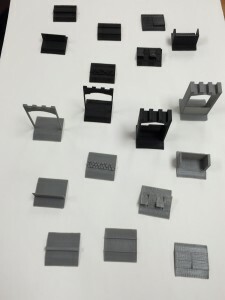 The printer then adds onto those layers to accurately form the three dimensional shape that we design for it on a computer, using modeling software. Printing is a timely process as it can take anywhere from 30 minutes for small, simple prints to over a day for larger, more complex prints! 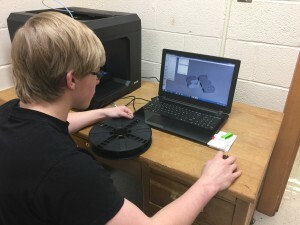 With the printer, the 5172 Robotics team has already created numerous items that will assist in the classroom and will help the team to strategize at the robotics competitions. We made a miniature arena that is a tiny replica of the arena that the robots will be competing in. This includes all the obstacles we will have to conquer, and even robots so we can discuss with other teams on our alliance just what we want each robot to do in every match. We used a miniature arena at last years competitions that was created by our programming/electrical mentor-Steven Hlucny- and it proved to be very beneficial! Thank you again to the Greenbush Community for the grant that allowed us to purchase our printer! 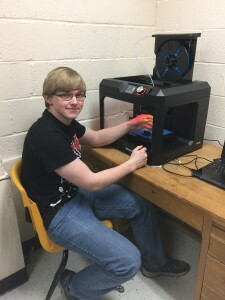 Callahan Stewart fills the 3D printer with a new spool of plastic. Callahan is uploading an image he is going to print. Mini Defenses that will be used in the Stronghold Competition.